The Aztec Empire was a multi-ethnic empire where the capital-city of Tenochtitlan in particular saw people from different parts of the empire intermingling. But there was a common religion and more or less uniform cultural traditions and customs in the Aztec society which were developed over the course of several centuries. They had a rich set of cultural practices and religious rituals which, as the empire expanded, brought into its fold the cultural and religious practices of other city-states as well. The history of Aztec customs and traditions naturally began with the founding of the capital city of Tenochtitlan on the swampy island of Lake Texcoco in 1325. Before that the Aztecs were a group with specific customs and traditions but most of that is unknown. After the establishment of the Aztec Empire in 1428, various additions and modifications were brought about in Aztec customs and laws as time passed, and eventually the main emphasis was put on martial virtues. The Aztec customs in their daily life revolved around work and worship. For children, education was necessary and thus all the children above a certain age were sent to schools where the male students, according to the Aztec custom, also received basic military education. As per the custom, men took care of the outdoor tasks such as trading and purchasing while the women were responsible for managing the household, although some women did indulge in outdoor activities as well and this was not a major taboo. Aztec customs included a rich set of rituals, prayers, and religious worship. Religion was all-important for the Aztecs and thus almost every field of life was inspired and influenced by religion. Prayer was a part of everyday Aztec customs and not just the priests in the temple but also the ordinary people who prayed every day. For this purpose, a special place was reserved in every household as a shrine where the family prayed. Fasting was also part of Aztec religious culture and some priests even indulged in fasting all around the year. Fasting was also undertaken by the common people and even the emperors. Aztec religion was a polytheistic set of beliefs and thus there were dozens of gods and goddesses in Aztec religion, each with his or her unique powers. In Aztec custom and religious beliefs, gods, nature, and humans were interconnected and a particularly important place was reserved for military conquests and human sacrifice. Use of psychoactive drugs and singing and dancing were important features of Aztec religious customs and traditions. The Aztecs also had rich burial rites and customs emerging from their unique beliefs about death and the afterlife. 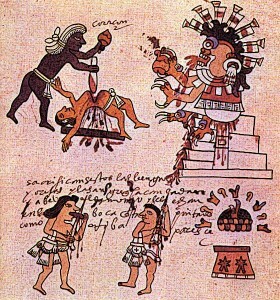 Human sacrifice was one of the supremely important parts of Aztec customs and religion. The sacrificial rituals varied depending on the god who was being offered the sacrifice. For instance, some victims were drowned as an offering to the rain god, Tlaloc. Similarly, some were treated as impersonators of gods and were worshipped for sometime before being sacrificed. The sacrificial Aztec customs also included child sacrifice and children were mainly sacrificed for the maize gods. Mostly, war captives were used for the ritual of human sacrifice and to make sure a steady supply of war captives constant battles raged between the Aztecs and other city-states. Aztec society was a very class conscious society and a rigid social hierarchy was put into place supported by laws and Aztec customs. As per these customs, special privileges were reserved for the nobility and emperors. The rulers were considered the descendants of gods and thus ruled by divine right. Aztec customs and laws also barred the common people from wearing certain kinds of clothes and jewelry exclusively reserved for the nobility and emperors. These laws resemble the medieval laws and customs which were also prevalent in Europe. As per the custom, there were separate schools for common children and the children of the nobility. Aztec customs related to petty peasants were not very different from the customs related to European serfs at the same. Petty peasants tilled and harvested the land of their masters and, just like the serfs, could be sold to the new master along with the land. Aztec customs related to slaves allowed them to marry and have children and these children were considered free. On the other hand, a free man who indulged in crime or was not able to pay his debt could be sold into slavery. An interesting Aztec custom was that if a slave ran away and entered the palace of the king, he was freed. There was a special class of Aztec tradesmen who travelled throughout the empire and traded between different parts of the empire. This trading class was quite wealthy and was allowed to amass considerable amount of wealth. However, as per the Aztec custom, the traders were not allowed to display their wealth because this was a privilege of the nobility. But their status was better than the status of the ordinary people and they enjoyed good relationships with the nobility. In the domain of education, perhaps the most important of all Aztec customs was that basic military training was compulsory for male students over a certain age. Another Aztec custom about education was that the children of the nobility and those of the commoners received education in separate schools. Further, there were also separate schools for boys and girls. Education was compulsory for the all Aztecs regardless of gender. Aztecs migrated from the north and established their city-state of Tenochtitlan in 1325. That became a starting point of the development of rich cultural and religious customs. These were influenced partly by previous Mesoamerican civilisations and partly by their own requirements. The Aztec customs included a class society with rigid social hierarchy, omnipresence of religion in all the domains of life, human sacrifice, compulsory education for all children and basic military education for all the male students above a certain age, and certain privileges of the ruling class and the nobility.